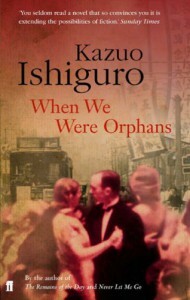 I got this book from the library to read while waiting on Ishiguro's book "Never Let Me Go". The writing is very well done, and the plot promised to be interesting. However I found myself never really liking the main character or caring what happened to him.Christopher Banks grew up in Shanghai in the early 1900's. When he is about 10, his parents disappear without a trace. Banks moves to England to be raised by an elderly aunt. He is educated at Cambridge, and eventually becomes a detective, primarily to return to Shanghai and find out what happened to his parents. When he does go back to Shanghai in the late 1930's, it is during the Sino-Japanese war (a conflict between China and Japan). The plot is interspersed with many flashbacks and memories of particular events he experienced as a child, but that now have new significance with his adult understanding of the world. Or do they? Does he remember correctly? Or is what he remembered colored by the emotional toll he has paid all these years in being an orphan? The scenes of the conflicts between the Japanese and Chinese fighting during the 1937 fighting in Shanghai are particularly fuzzy and surreal. You end up not knowing what is real and what is something conjured out of Banks' imagination.